When I first read Candide I was amazed at how funny something so tragic could be. That was one of the first books I read that broke through some internal barriers and encouraged me to go beyond my comfort zone in hopes of finding literary gold. How an effeminate yet painfully optimistic man can cheat death as many times as he did even without the cleaver that he didn’t have in 1484, while death was all around him was amazing. As crazy and as hard as it was to read, it was eventually digestible and most certainly thrill ride through a troubled time. This book however; takes absurdity to a whole new level with intergalactic time travel, to extended lengths of stay and preferred customer cards at Pluto’s finest psychiatric wards. At the heart of disturbance is Voltaire’s channeling of his femme fatale instigated by his naked ramblings and meanderings which leads to his surviving collisions with asteroids as a means to a quick getaway. You see, the spaceship is Voltaire’s preferred mode of transportation, but preference does not indicate performance, which is made evident on plenty of occasions. This book covers plenty of bases for the insane, chemically imbalanced, schizophrenic, or straight up hallucinogenic, if you checked any or all of the above you may read this and never come back, so proceed with caution. 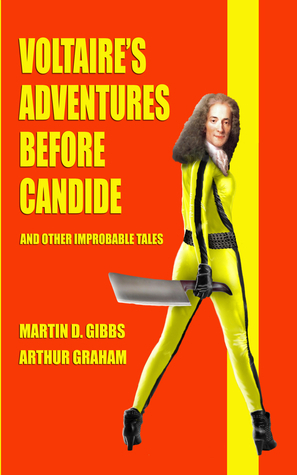 This book takes some of the common elements of Candide and takes them to a whole new dimension. After encountering writer’s block in his attempt to finish the book of no working title which would later be recognized as Candide, our hero François-Marie Arouet or simply Voltaire, decides to jettison Earth to spruce things up a bit and travel to “the dingy armpit of the solar system” or more commonly known as Mars. Viewing this as merely a quick stopover and of course escaping death(what else is new), he heads to his favourite planet Mercury where his enchanting seven-eyed princess awaits. Lucky for him his active imagination during the most ravenous events allow him to handle these formalities with his special green-tailed girl. Just to let everyone know that this all happened within the first few pages so it is quite clear the lengths that will be traveled in the following pages. There were quite a few references throughout the book that were very interesting, but the one that got me bewildered was that of Flip F*****g Saunders (Rest In Peace). One of the most psychologically-torn coaches of my generation with the most involuntary body movements, and we get a play sequence to boot. Another fun thought was that at times you get the feeling like the characters are speaking directly to the reader about presumptions we may have. They also feel like they embodied themselves on the paper and the author was trying to tether them enough to have some freedom, but restrain them enough so they didn’t fly off the page, which would eventually lead to insults flung in the author’s direction. My previous experiences with “bizzaro” fiction is quite limited but I try to extend myself as much as possible. Breakfast of Champions is one of my favourite books that fits in this genre. Hideous Exuberance and Friction are also books I enjoyed. The problem I had with this book centers around what happens to be one of the main motivations of the author, utter chaos. So, in the end it is mainly my fault for requiring more order and in turn not liking it as much as I had hoped. With the formerly listed books, I felt like I was being led by the authors across a highway intersection, hand in hand reliant on trust, with this book I felt the author kicked me in the back into traffic and ran the other way frolicking and laughing like he was The Road Runner and I was Wile E. Coyote. One method tested your faith, the other tested your durability, either way I am alive to talk about it. 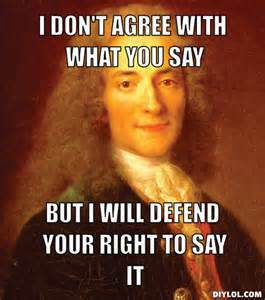 I Guess me and Voltaire have something in common.